Retrieve messages and pictures from social platforms easily. 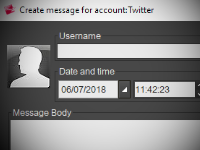 Let your social media manager select and candidate the desired messages from any number of accounts created inside SocialServer on the supported social platforms while comfortably sitting in front of a laptop. 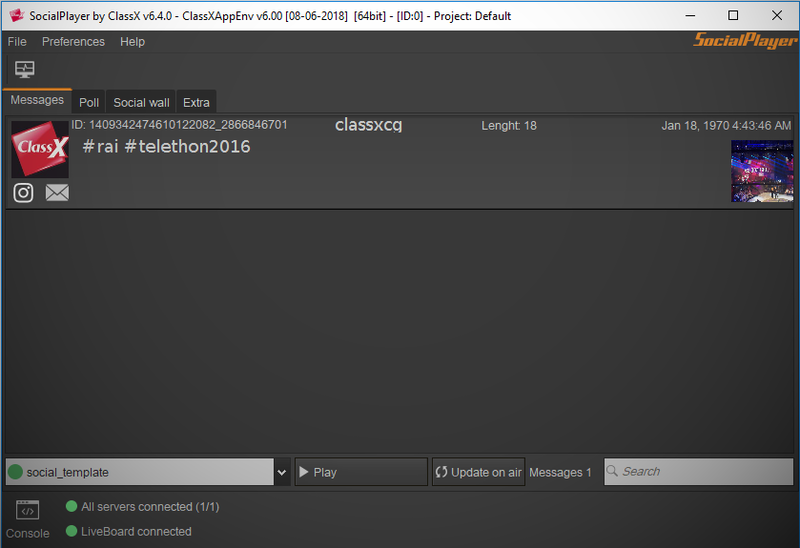 Send the candidated messages to the SocialPlayer via TCP-IP and let the contents be triggered on air from there. 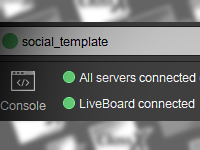 This is only one of the many flexible scenarios that SocialServer, SocialPlayer and LiveBoard can have a role in. Flexibility, versatility and professional broadcast quality graphics. 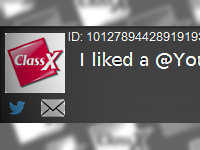 ClassX goes social. Nice and sociable with everyone. ClassX SocialServer will do the download of social messages and pictures and who manages it will candidate the desired messages; you can have more than one SocialServer connecting to a SocialPlayer, who will trigger the contents on air through LiveBoard, LiveBoard LE, LiveBoard SCG or StealthCG. 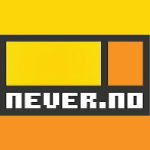 SocialServer includes a powerful multilingual badword dictionary that analyzes and notifies unwanted words and messages with a bright yellow marker. You can set the App to automatically replace the undesired text, if you wish. The badwords list can be added and expanded manually in the Prefs Panel. 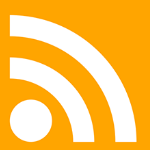 Export the list of candidated messages to CSV or RSS files, ready to be used by LiveBoad´s StyledTicker. 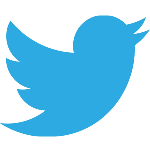 Show the Twitter, Facebook and SMS messages with avatar and username in a crawl. Everything is completely automatic and looks great. 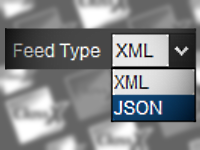 Read messages from a CSV/XML/TXT files. 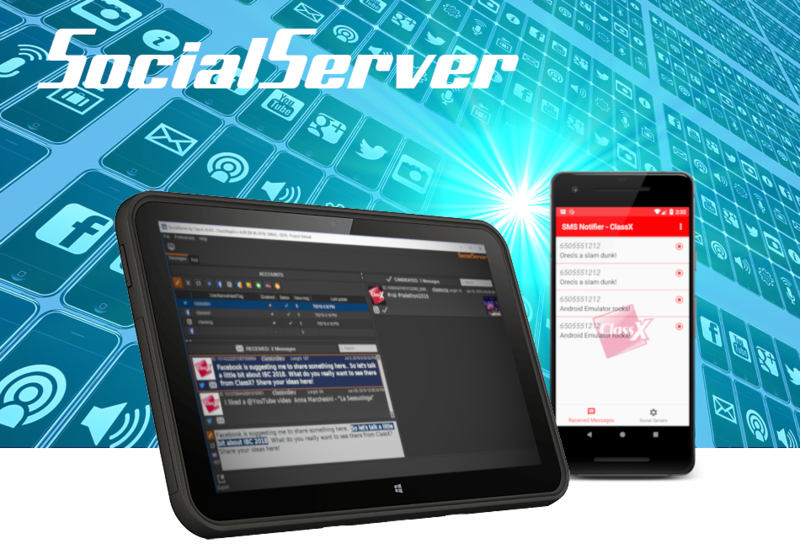 SocialServer opens its doors to the Social world with simplicity and completeness. 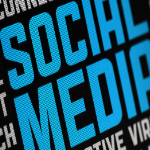 Even the most demanding productions will find their Social Solution with it, without exception. There may come the situation in which you need to create a message coming from a selected SocialPlatform. You can do it; add the picture, username and the message. For emergency situations. You can choose when to download the messages. You can do it manually by pressing the rerefresh button or simply wait, in the Prefs you can set how frequently you want SocialServer to check for new messages automatically. You even may force the download of earlier downloaded messages if there is the need for it. 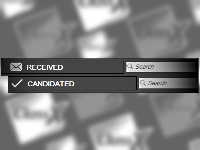 Filter the received and candidates messages. The result is clear, simply numbered. Find what you´re looking for in a second. Perfect. Twitter, Facebook, SMS. No mistakes, you can be sure of what goes on air. The editing box shows you automatically how many characters a message has, as soon as you select it. 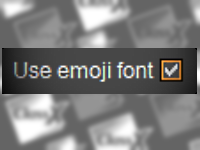 Makes you confident it will fit into the graphic template that you chose to show the messages. 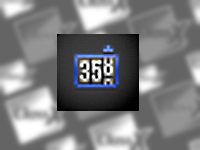 SocialServer can read the emojis and the ClassX Graphic Engine can perfectly render them. After all, nowadays messages never go without some smiles, kisses or tears! 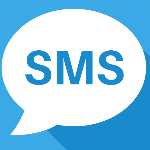 Make it easier than ever to configure an Android phone with a working SIM card and continuous GSM connection to retrieve SMS messages for SocialServer. 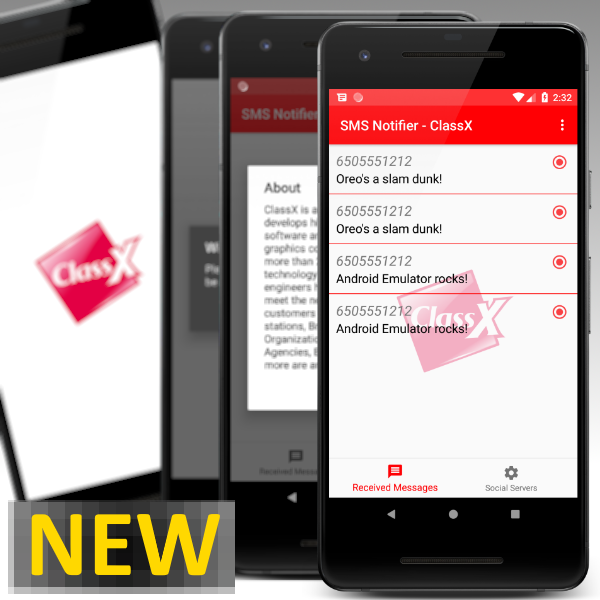 Follow the simple instructions, make sure the mobile device is on the same Wi-Fi newtork and be sure that all incoming SMS messages will be instantly pushed to ClassX´s SocialServer. Server and Player: made for each other. Connect and play. 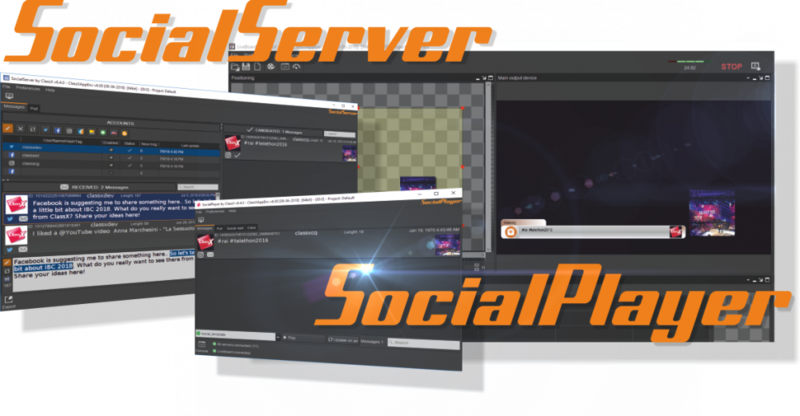 SocialServer can handle any number of accounts of supported social platform types. 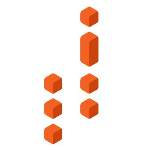 ClassX´s mission is to keep up with the constant evolution of social network API and flexible integration. This is why it is the only ClassX product to have an annual, internet-based network license. Messages always ready to be played. SocialPlayer integrates everything you need, without sacrificing anything. Simultaneous connection to any number of SocialServer, automatic or manual broadcast of new messages, push notifications, instant update. Tricky? No, because it´s designed for you. And there is free, no license needed. 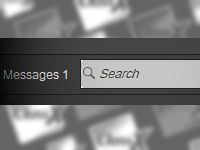 As soon as there are new messages, SocialPlayer alerts you in the tray icons. No time for refresh needed; candidated messages from SocialServer are pushed to SocialPlayer directly. Receive the messages from various SocialServers and send them on air them with one click. 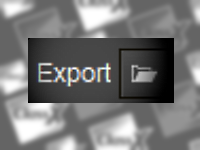 You can do it manually or let SocialPlayer do it for you automatically. After all, arriving messages are all badword-checked and candidated by the SocialServer Manager. The message list can get a little long in SocialPlayer; especially if various SocialServers push their messages to it. Find the message you were looking for in a second. With the advanced text filter, each request is a "yes". Username, avatar, social network platform, message state, message text, message ID, status.... Do you need more? The status of an aired message will change to "sent" but if by any chance you need to send the same message again.. just change it and broadcast it again. SocialWall. The elegant way to display social media feeds. Empower your event by creating a new visual experience; let everybody post messages using Twitter, Facebook and Instagram to your wall. 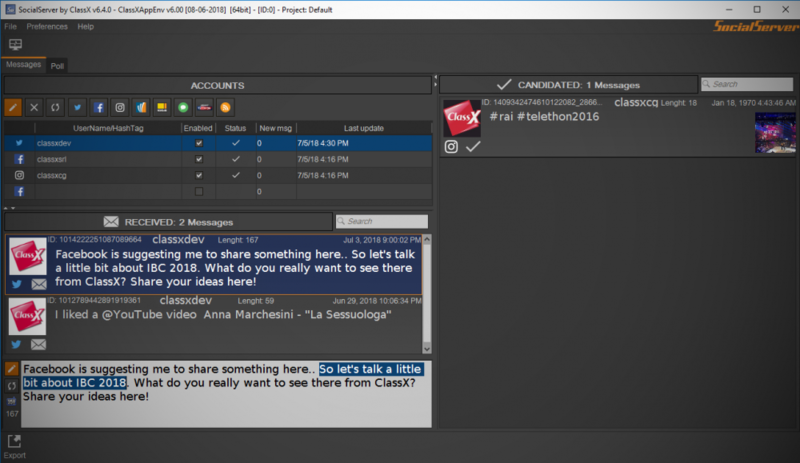 SocialWall allows you to create an interactive broadcast-quality social window, including moderation & advanced search. Catch your audience with an attractive background tailored to your event. Customize your SocialWall with custom graphics and effects to reflect your channel branding. Increase your social relevance and engage your audience. One single solution, easy to setup, affordable and cost effective. Set up, air, sit back and enjoy. What does your audience feel? Use Parterre and grab the audiences´ emotions. Twitter is fun and easy to use, but the single message is submerged by all others in a moment. It´s now time to have an alternative way to express your TV audience´s opinion. Engage them all through a new exciting social experience, the Parterre second screen app. 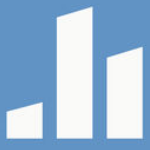 Display applauses, whistles, and generally votes from your audience´s smartphones instantly. 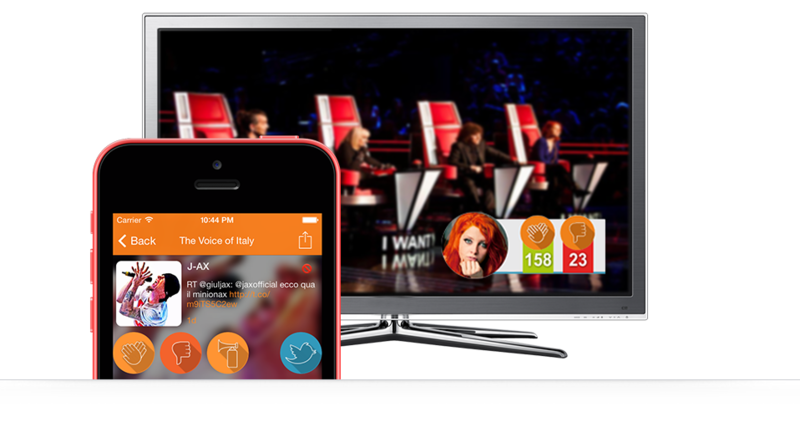 Engage your public with a tailored app, perfect for your show. Lots of features included. Make yourself comfortable, no stress. The relaxed way. In SocialServer... scroll through the messages and select one to edit. 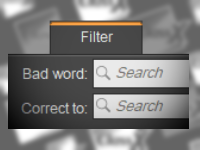 The integrated badword filter notifies and automatically corrects unwanted messages and helps you to avoid mistakes. Have you made a change but now want to go back? 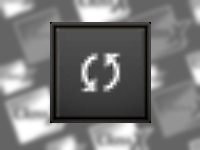 Don´t worry, you can always reload the original message again. The character count helps you to keep an eye on the length of the text that you will display on air. Twitter, Facebook, Instagram, Spredfast, SMS and more. 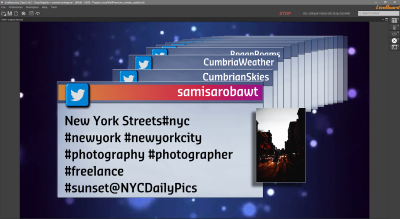 View messages from a Twitter, Facebook, Instagram accounts or do a hashtag search. Use Spreadfast streams. Import SMS, use online services and manage everything in a single window, all in front of your eyes. Drag´n´drop based. SocialServer, I like it! View and filter Tweets, Facebook and Instagram messages. 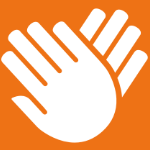 Import SMS, Never.No or Spredfast streams and manage everything with the simplest drag´n´drop gestures. Ready. Why settle. Get the best. Intelligent message handling, automatic or manual update, advanced text filter, multilingual bad word dictionary, import/export to CSV/RSS/XML and online SMS services. On air, with style. 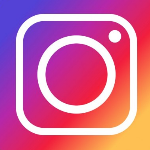 Our application does not store and therefore does not save the data of users who write posts and / or comments to posts on Facebook / Twitter / Instagram ..... The data used are not sold to third parties.